Happy family holidays with babies and toddlers; pack their little Trunki’s and enjoy a family holiday! The arrival of your first child brings many wonderful new experiences to your life, you will be amazed by how much love you feel for this tiny person and your new- found ability to care for another human being. Life will change after you become a family, it will be an incredible journey and there will be lots of firsts, like your first holiday as a family. Some of your new parent friends will embrace this with an ambitious approach, strapping a baby to their back and hiking around the world, others will be too stressed to even contemplate a night away and settle for holidays at home for years to come. Clearly neither of the above is an ideal situation and that is where Luxury Family Hotels step in. Our beautiful properties are reminiscent of the gorgeous country house boltholes you enjoyed romantic escapes to as a couple. There are comfortable, stylish bedrooms, luxurious bathrooms, great food, a comprehensive cocktail list and spas to relax in. In addition there is a genuine warm welcome for your little ones and everything they need to make this a break for all of you – even the family dog is welcome! Luxury Family Hotels were established almost 30 years ago, since then we have learnt a lot about how to deliver a much-needed happy holiday experience for families, especially when travelling with babies and toddlers. A lot has changed over the years, parenting styles, dining habits, expectations of a hotel break and views on childcare and we have adapted and developed and will continue to do so, to ensure we deliver the best possible family experience. When you make a booking we find out as much as possible about your requirements so that when you arrive everything is ready for you in your room which means your car is not crammed with cots, sterilisers etc. Our team welcome you with warm smiles and helping hands, there are toys in reception to keep our smaller guests happy while we check you in. Children under-two eat free, we will chop, puree or warm too. Warm milk is always available. Our Den’s are Ofsted registered and offer lots of fun activities for little ones and a space for you to spend time with them doing what they enjoy most, i.e. playing. Pools are child friendly all the time, not just for an hour or two each day. Plenty of outside play areas and fresh air fun and games. Family dining or adult only dining, add to this baby listening or a pre-booked babysitter and you can enjoy a special night together. 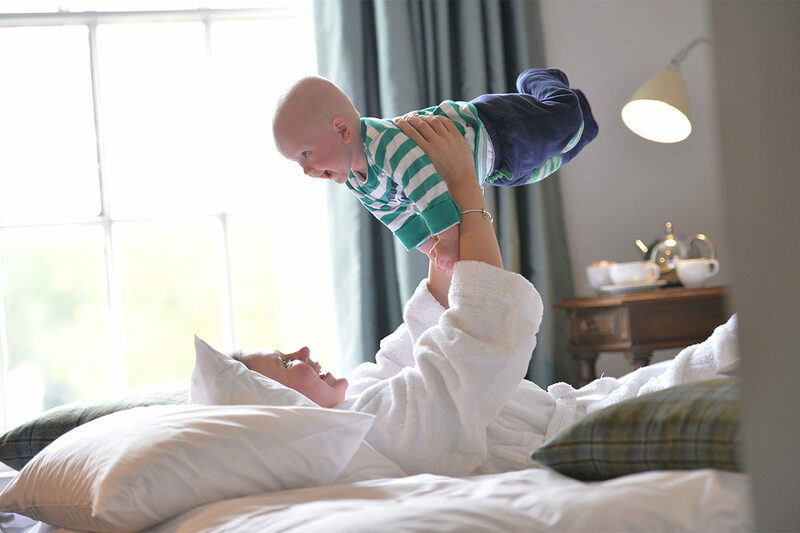 As each of our hotels is very different, they have all created unique baby or toddler experiences, perfectly packaged to ensure that there is something for everyone and all include a lovely baby or toddler welcome hamper. At Woolley Grange, your baby can have a swimming lesson with Puddleducks, whilst toddlers can be whisked away for breakfast club play time (to let you have an extra hour in bed). Moonfleet Manor Toddler Break includes tickets to the Weymouth Sealife Centre and at New Park Manor each break includes two 30 minute or one 60 minute relaxing Elemis spa treatment. A Toddler Break at The Ickworth includes a 30-minute beauty treatment and a Micro Trike to use during your stay. Fowey’s Baby Break includes an indulgent 30-minute Elemis treatment. Each hotel offers two hours supervised Den time giving you a rare chance to spend time together. Embrace early mornings, swimming before breakfast, re-discovering the joy of walking in the rain, splashing in puddles and re-read your favourite childhood books with your own little ones. All of this is much more relaxing when there is someone on hand to deliver tea and cake, throw another log on the fire and pour a good G&T after lights out for the little ones. Rest assured that luxury breaks are still possible as a parent; they just look a little bit different. Click the hotel of your choice to find out more and make a booking.